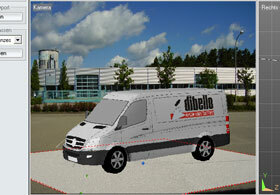 For an realistic 3D presentation you have the possibility to place your 3D object onto a digital background photo. 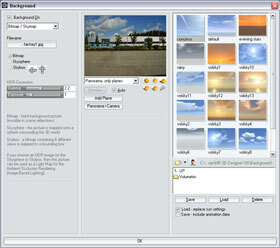 The dialog window Background will appear on your screen. In the left column you can turn the Background on. 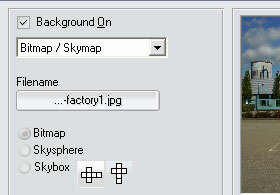 Choose Bitmap/Skymap from the list box. Use the button Filename to load your digital photo. Important: Take care that this file is saved in you project folder ,the same folder like the 3d file. In the middle of your screen you will get an fast preview of your photo. Make sure that the 3D object will have the same proportion as well as the same angle so that the complete scenery looks authentic. 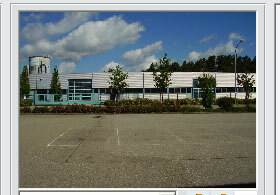 Change the Picture Resolution of your renderings to the same ratio like the backgound image. 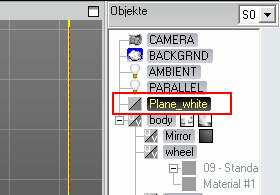 If your background is still white , select the object Plane_white with the right mousebutton and choose properties. The object Plane_white is now transparent.